HockeyPucks hiking and highpointing: Mt. Isolation - 4004 Ft. PARKING: From Jackson NH Follow route 16 north for 5 miles. The Rocky Branch parking area is on the left hand side. There is ample parking for many cars. From parking the Rocky Branch trail leaves the northwest corner of the parking lot and meanders it's way through a hardwood forest making many twists and turns. It climbs moderately following an old logging road. At 1.25 miles the trail turns left and ascends approximately 0.5 miles where the trail levels and follows a contour line for another 0.5 miles. 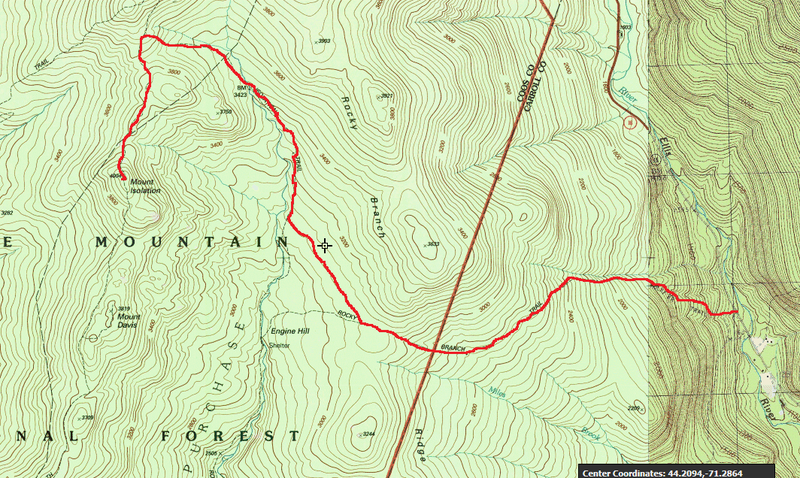 the Rocky Branch trail makes a right and climbs moderately to the Presidential Range - Dry River Wilderness boundary. 0.6 miles after the wilderness boundary and 2.75 miles from your car you reach the almost unperceivable height of land, elevation 3100 feet. The exact point where the trail switches to a downward grade is hard to spot however the "Engine Hill" bushwhack begins at an open section near this location. The Engine Hill bushwhack saves about 1.5 miles of hiking and is one of the easiest bushwhacks in the white mountains. It's simple for several reasons. 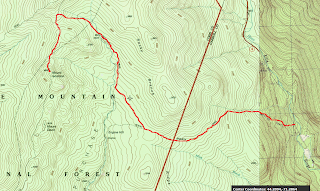 It travels directly northwest following the 3100 foot contour line of Engine Hill through a birch glade and ferns 0.75 miles to the Isolation trail. The Isolation trail parallels the right side of Rocky Branch stream and your bushwhack exit point should have put you on a very old and unnoticeable railroad grade. Follow the Isolation trail .8 miles to a crossing of Rocky Branch. The Isolation trail swings to the left and climbs easily 0.9 miles to Davis Path. Turn left (south) onto Davis Path and follow it's moderate grade 0.75 miles to the Mt. Isolation Spur trail. From here it's a short 0.1 mile pitch to the open summit of Mt. Isolation. Absorb the panoramic views from the Isolated summit. Well done! At 4004 feet Mt. Isolation barely makes the list of NH 4000 footers falling at #47. The 6+ mile one way distance deep into the Presidential Range - Dry River Wilderness makes it a very intimidating mountain to plan for and is typically one of the last mountains hikers complete. It's open summit offer some of the most amazing views in the White Mountains and is definitely worth visiting. ** My 5.5 hour hiking time is extremely quick and not typical. Plan for 7 to 8 hours. A sign marking the junction of the Mt. Isolation spur trail and Davis Path. The weather didn't cooperate and I had very limited views from the open summit.